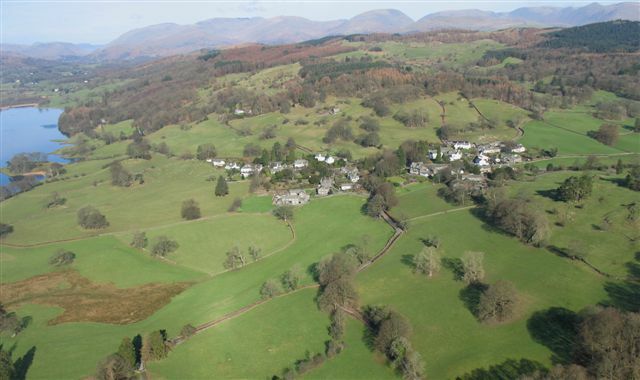 The attractive village of Near Sawrey is situated two miles from Hawkshead down the eastern side of Esthwaite Water, overlooked by the woods and tarns of Claife Heights. There are two seperate hamlets – Near Sawrey and Far Sawrey, both a cluster of pictureque cottages, teas rooms and pubs. Hill Top – the home of Beatrix Potter. 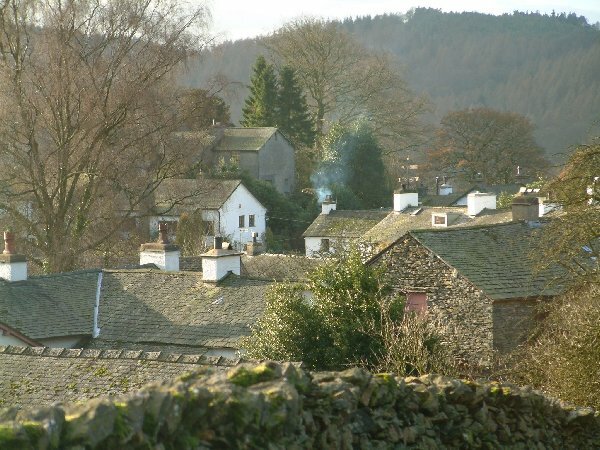 Near Sawrey is famous for Hill Top, a 17th century farmhouse which was the home of Beatrix Potter. Beatrix wrote many of her famous children’s stories in this little house. Characters such as Tom Kitten, Samuel Whiskers and Jemima Puddleduck were all created here, and the books contain many pictures based on the house and garden. She bought Hill Top farm in 1905 from the proceeds of the sale of the first of her little tales, Peter Rabbit. 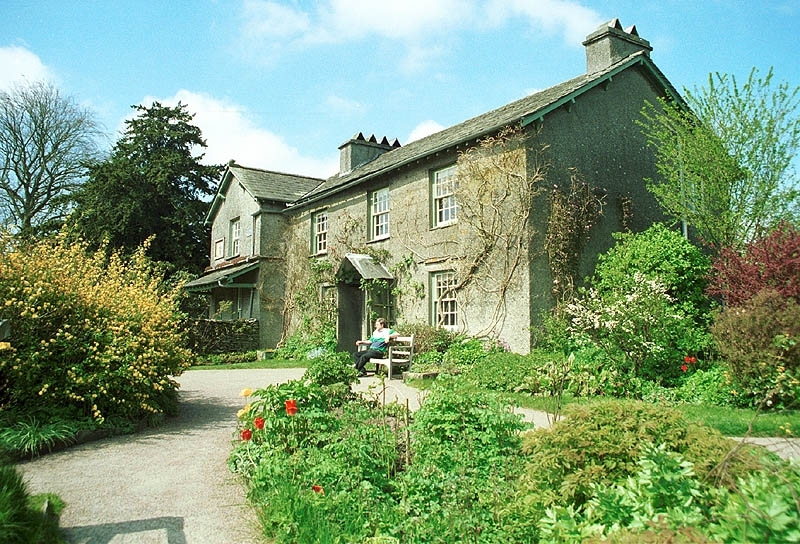 The property is now a museum, owned and run by the National Trust and is one of the most visited houses in the Lake District, with queues forming on most days during the summer. 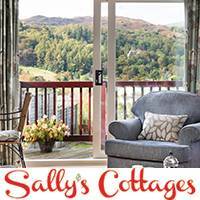 She also lived down the road at Castle Cottage but that is not open to the public. 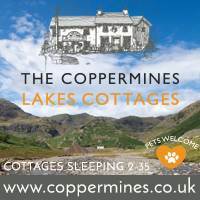 Bar lunches and evening meals can be obtained during licensing hours from the Tower Bank Arms (National Trust owned) next door to Hill Top. The Tower Bank Arms may be seen in ‘The Tale of Jemima Puddleduck’. St Peter’s Church at Far Sawrey is a large Victorian Church in the early English Gothic style, with seating for 400 people. There were many large houses in the area, all of which had servants who were expected to attend services with their families. 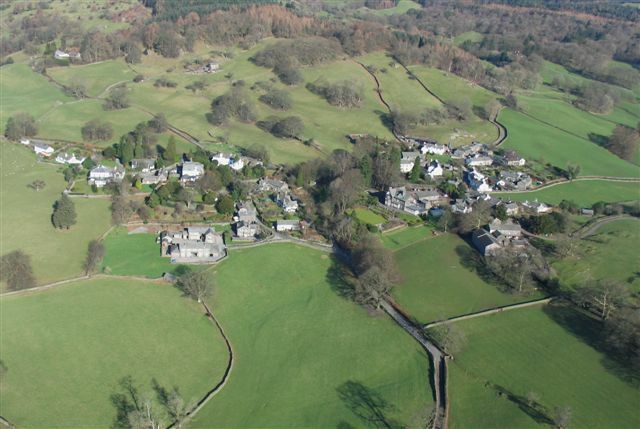 Looking to Far Sawrey, Near Sawrey and Esthwaite Water. St Peter’s Church lower centre. 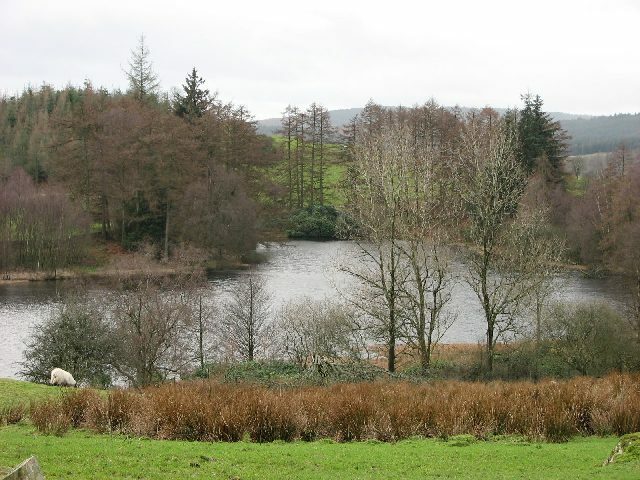 Moss Eccles Tarn is just a short walk from Near Sawrey. 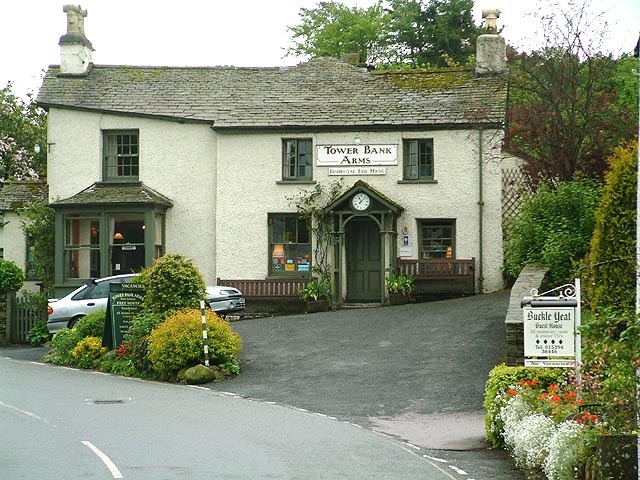 It was here that Beatrix Potter spent many an hour fishing – from a rowing boat that can now be seen at the Steamboat Museum at Windermere. It is thought that the water lillies on Moss Eccles inspired the story of Jeremy Fisher. 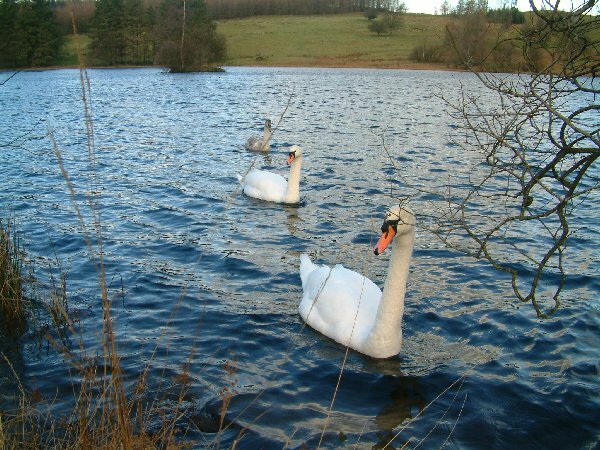 Beatrix Potter bought part of the tarn in 1926, and on her death it was given to the National Trust. 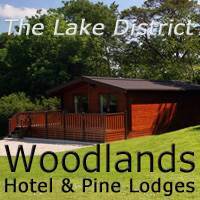 It is recognised as a Site of Special Scientific Interest. Bowness Ferry connects the road through Near and Far Sawrey with Bowness-on-Windermere. 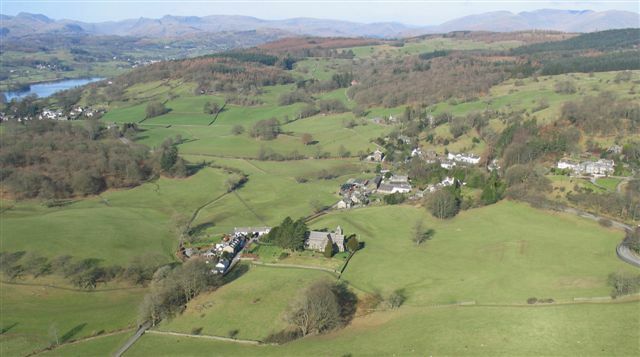 At nearby Claife Heights, is Claife Station, built in the 1790s – a viewpoint where visitors can look at Windermere lake. It was most fashionable with tourists in the 1830s and 40s.